PITTSBURGH — Josh Bell is a 6-foot-2 and 230 pounds. He looks more like a defensive end than a first baseman and though mild-mannered, he certainly seems like the kind of guy you wouldn’t want to get on the bad side of. Bell is — to the best of my reporting ability — not a fairy, nor does he possess pixie dust. But it’s an apt nickname nonetheless, not due to his physical stature or ability to fly, but because he spends most of his energy at the clubhouse tinkering with his swing mechanics. His last name is Bell. You get it yet? Clever nickname aside, Bell has earned his reputation. Friday night, he hit a home run with a new bat. He’s completely changed the way he gathers himself before his swing this season, going from a big step to more of a toe tap and then all the way back again, all in an effort to get his front foot down sooner. Those haven’t been linear processes. Every day, it seems, it’s been too much of something or not enough of something else and so Bell goes back to the video, back to the batting cage and well, tinkers. Then you can multiply that effort by two, as Bell has had different swings from each side of the plate. For Hurdle and Bell, the biggest issue has been getting his front foot down quicker and most of the changes have been made with that in mind. In that regard, his latest approach is throwback to what he was doing a year ago. 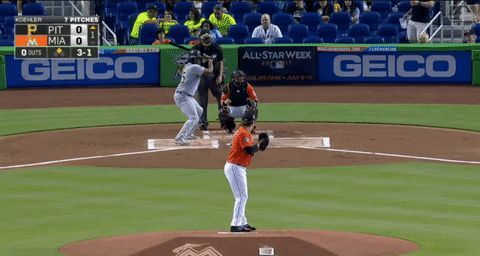 This is what Bell’s swing looked like when he first came up to the majors last July. This is from late April, as Bell was trying a different method of gathering himself, going to more of a toe-tap than a step. Now, he’s back to what he was doing before. In fact, he’s gone back to something that more closely resembles his natural swing, before he started his tinkering. Bell came up to the majors with a reputation of being a power hitter from the left side and an an average hitter from the right. But he’s developing more power from the right side as of late, as I’ve written about recently. With everything changing with his left-handed swing, it was too much to do make the same type of adjustments the other way. So Bell just starting doing whatever he was doing left-handed, right-handed. The results have been promising. David Freese said his right hamstring injury is progressing but still has no timetable for a return or even a plan for whether or not a rehab assignment will be necessary. … Francisco Cervelli (right foot discomfort) will catch for the third straight day. … Josh Harrison will hit lead-off for the second straight night. Prior to Saturday’s game, the Pirates announced that Jameson Taillon has been placed on the 10-day disabled list with groin discomfort. They have added RHP Josh Lindblom to the 40-man roster and promoted him to fill Taillon’s spot. Lindblom has a 2.50 ERA, with a 1.06 WHIP and a .209 BAA in 18 innings this season. His last full start was a six inning performance back on April 22nd, but he left his last start after one inning on April 29th after being hit on the foot with a liner. He has obviously recovered from that injury, though he hasn’t pitched since. The Pirates announced that Trevor Williams will start on Monday and that Lindblom will be available immediately out of the bullpen. The Taillon move was made retroactive to May 4th, so he will be eligible to return on the 14th. Where is Branson and Hurdle discussing McCutchen about to drop below Mendoza line? I’m a supporter of Cutch and believe in his overall game but to me his role as a third hitter I believe is also hurting his game as his approach is about power instead of being an on base mindset and using his athletic abilities. Suggestion to revamp the lineup, consider the injury issues and record as an opportunity to try something out of the box. This lineup is a joke right? Mercer batting cleanup followed by Jaso! Has to be a joke! Josh Harrison might be good Josh Harrison again. He’s hitting his lowest GB%, and his hard% is at a career high, and his chase rate is at a career low. That’s a lot of good things going for him. Thanks for not hating in J-Hay for being paid what he is worth. I’ve been in the camp that he’s been worth the money for the past couple years, or would have been had he stayed healthy. With the values going up, though, he will need to hit more than he did in 2015 and 2016, and signs are good he’s on that path this year. We must be the only two. I also am supporting JHay. Think of what the games versatile players are making, this is in line or lower. His defense is always a strong point as well. Now, this aside the question is if he should be an everyday starter or more of a flex play for a championship caliber squad- this point can be debated. I like JHay, but not $18 mil worth for 2017/2018. I thought he had a great year in 2014. He batted .315, played everywhere, and had 58 extra base hits – 38 doubles, 7 triples, and 13 HR. In 2015 and 2016 he averaged .285, 35 extra base hits – 27 doubles, 4 triples, and 4 HR. His years prior to 2014 were not very impressive. If you were analyzing stocks for your retirement portfolio would you want to buy that one year return at a high premium or would you look at the trend before and after that one year and decide the risk might be too high? Harrison would be making around $7 million in his third arbitration years this season and when Howie Kendrick, worth 2 to 2.5 Wins over two seasons and a thousand plate appearances, gets 2 years and $20 million, $10.25 million for Harrison isn’t some anchor. League average players are a little more scarce than stock options. I think his best position is a super utility who plays regularly, a 10th man so to speak. Is the 40 man roster full? I call the pirates the china dolls. What does Jeff Branson say about the way that McCutchen and Polanco are approaching each at bat? Does he have any theories about why they are off to rough starts? If he doesn’t, maybe that should ask Searage to take a look. Cutch has some ugly swings, like he isn’t seeing the ball well, but he is making solid hard contact. Polanco just looks bad. I agree, I think his eyesight has degraded since 2015. I doubt that Jeff Branson is the right person for that job. 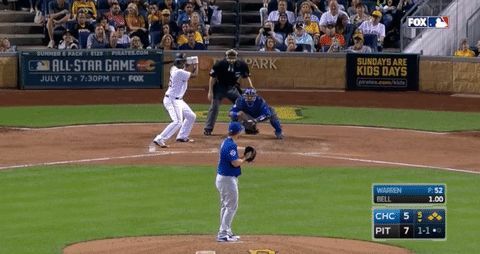 Can all of our hitters be Josh Bell? Maybe then we’d score some runs. Cutch with no outs and the bases juiced hit into the worst possible double play. We need a lot more out of him than that. That was bad. I was at a bar with friends and said, ” the Pirates have the bases loaded with no outs, hopefully they can scratch out a run”. Next pitch, Cutch hits into the DP, which is about what I expected. On that same note, do they not teach pitchers base running? Cole didn’t even try to make it to the base. I’m fine with what he did. If he was going to get back into the base, it would mean a headfirst dive, most likely, and I don’t ever want to see one of our starting pitchers do that. I agree, but he should at least run toward the base to make the catcher throw the ball. I don’t want him diving, but he was almost 10′ out of the baseline. How about the attempted bunt right after Bell doubles to lead off the 4th inning? The ball was center cut and up a little – perfect for hitting behind the runner. Does Cora need to walk down and explain the situation to these guys. The AB you are talking about started with ‘Cutch again getting the first pitch on the outside corner. The guy is a very dangerous hitter when he sees the ball deep and goes oppo. For May he is 3 for 24, and against RHP’s so far in 2017 he is hitting .163. The baserunning by Cervelli and Jaso in the 2nd inning??? Pitiful. Now Taillon goes down. It’s just one thing after another with this team. Who goes down next? The way things are going, Nova. Thankfully it’s a groin pull and not an arm issue. 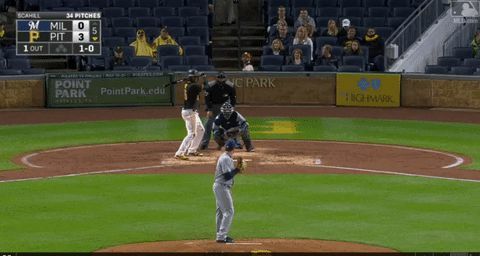 A pitiful exhibition of baserunning by two veterans who should know better – Cervelli and Jaso – to run the Pirates out of a potential big inning in the 2nd, then in the 4th after Bell doubles to the notch in LC to lead off the inning, ‘Cutch tries to bunt on the first pitch instead of trying to hit behind the runner. The Pirates are already down four of our best offensive contributors – Marte, Kang, Freese, and Frazier – and can ill afford this type of play. Jaso has been a liability not an asset this season. Time to bite the bullet, swallow his salary and release him when Frazier is ready to come back. Cole and Nova should wear Glasnow’s jersey maybe then they’ll get run support. Can’t really think the young man appreciates being called tinkerbell. Lousy nickname. Hopefully he stands up for himself before too long. Seems like something that could get ugly (not with you guys). The novelty of putting the two words together AND the irony of one of them being his last name is interesting for a couple of seconds. Then it gets into a mean spirited slur kind of thing that meatheads just can’t let go. His mom is a professor of human resources management (I didn’t know that existed, but there you go). I suspect he might not be well versed in the give and take of insult performance. Tim should send him a copy of Gran Torino. Seriously, what grown man would let his nickname be tinkerbell? I like Cutch but remember when Cutch no-sold him on his first major league home run against the Cubs? He might be taking a bunch of sh!t. Fight kid, damn. Also, who are the guys in the team that call him tinkerbell? …or he just legitimately doesn’t mind it. Some people actually enjoy being prodded a bit, as long as they trust the people doing it. (I am one such person.) Also, how is his mother’s job relevant in whether or not he’s capable of understanding the social dynamic in the sport he’s been playing since he was five? True. He might think its fine. His mom’s job would lead me to think that he wasn’t brought up in an environment where insults were allowed or part of ordinary discussion. He might not have the real world experience to “play along”. Prolly wrong. If its not killing him on the inside, go ahead and live it up, tinkerbell. He went to high school and played baseball there, so he’s definitely been in environments where insults happened frequently. Insult’s probably a strong word, anyway. There’s the line between ripping on each other in fun around and someone getting mean and the other person getting bullied. The trust issue you pointed out. Sometimes bullied people play along because they don’t want to be seen as ruining the party. Meh, who cares. Just sounded like a weird thing to call someone. if its cool, its cool. He offers it willingly, so I don’t think he’s embarrassed by it. Is it like calling a bald guy “curly” or a fat guy “slim”? Josh is a big guy so they call him the name a small, female fairy character because its the opposite of his appearance? Or is it really the “works on his swing” together with his last name? Or both. Can you get PhD in the etymology of nicknames? Can someone be too hung up on another’s nickname? I think it’s a good combination of both. The big, huge scary looking dude is the small, feminine animated character and he’s also legitimately a chronic tinkerer.